Proudly promoting "America's Ugliest Accent!" 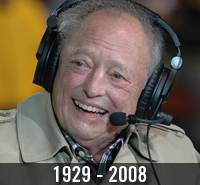 In loving memory of Myron Cope, without whom, much of this site would not exist. We'll miss you, Dr. Cope! "Yinz gotta be loose to rilly speak Pittsburghese." Warm Up with these exercises designed just for you! "Dere's many differ'nt parts of Pittsburghese!" Study up on your nouns, verbs, adjectives, phrases, people, places, sports, and more! How would Hamlet sound, had he been from da 'Burgh? Use our translator to find aht! Don't be ascared! Test yourself with this audio quiz! Check out our interview heard around the world on the Voice of America November 11-12, 2000! Doing actual research about Pittsburghese? You've come to the wrong place! Click here for some direction!